The drama of the Civil War continues to fascinate. A compelling saga to which we still respond, that is certainly in part because of the power of the stories; and perhaps because, even now, some of the old scars are not completely healed, and old wounds still beg explanation. In May of 1870, Robert Edward Lee was dying. It was to be the last spring of his life, and this he knew. In failing health and constant pain during the five years since war’s end, Lee had dedicated his last years to his family and to his work as the president of Washington College, a small, struggling school in the mountains of western Virginia. At the start of that year, at the urging of colleagues and family, the old General had reluctantly agreed to embark on “an extended travel” for his health. For many reasons, it became an intense personal odyssey for Lee. What was to have been tranquil and restorative became an arduous journey through a devastated land, as the ravaged South of the former Confederacy had only just begun to rebuild from the ruins of a total war. A disinclined hero and reticent symbol required by a vanquished people, he was left exhausted and depleted by the experience. At journey’s end, the play finds Lee at the secluded home of a family friend in the old port city of Norfolk, Virginia. The play’s action focuses on a single day among the last days of a noble life. As well as illuminating the complex character of R. E. Lee, a portrait is offered of his lovely, lonely daughter, Agnes. “The pretty one” of his four daughters, she had accompanied her beloved father throughout the postwar years as both companion and nurse. Seven other characters are also called upon to participate in a scenario regarding “that which has already occurred but remains unfinished,” and to consider that which “might have been.” These include a handsome young veteran, now a crippled newspaper reporter, impelled to pledge his silence about the greatest story of any journalist’s career. 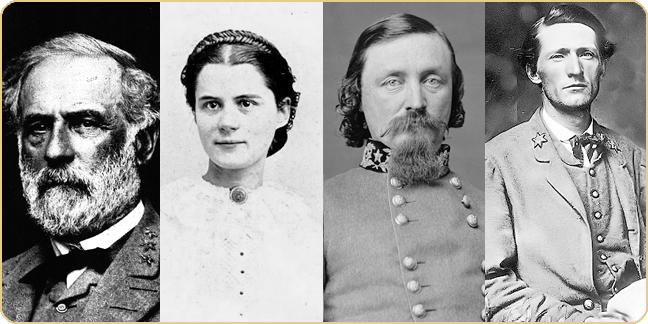 There is also the colorful, legendary figure of John S. Mosby, and the unexpected appearance of a provocative, tragic figure prominent both to history and Lee’s haunted past. Upon this visit the drama turns. Thoroughly researched for more than three years (with an available bibliography), the work is based on an actual framework of times, dates, first-person accounts, and a fundamental understanding of the troubled postwar period and the people involved. Examining the mortal consequences of great acts and tumultuous times, “True Honor, True Glory” (from Lee’s own penned words to his son) pursues questions related to the values of honesty and self-respect, coursed with unavoidable guilt, and finally – reconciliation. The story also acknowledges that subtle threads of concurrent happenings can be transcendent of time, all relating to the ultimate challenge of the quest for inner peace.